Mali's ngoni ace returns. After his celebrated debut album Segu Blue and the Grammy nominated follow-up I Speak Fula, hundreds of concerts all over the globe, an appearance headlining the AfroCubism project and, just a few months ago, stunning appearances at the latest Africa Express events performing with Sir Paul McCartney, Damon Albarn and many others, Bassekou Kouyate is back with his new album Jama Ko, recorded by Howard Bilerman (Arcade Fire, Godspeed You! Black Emperor, Coeur de Pirate) and out now on Out Here Records (CD/ Download/ Vinyl) / OH021 / UK distribution by Proper). 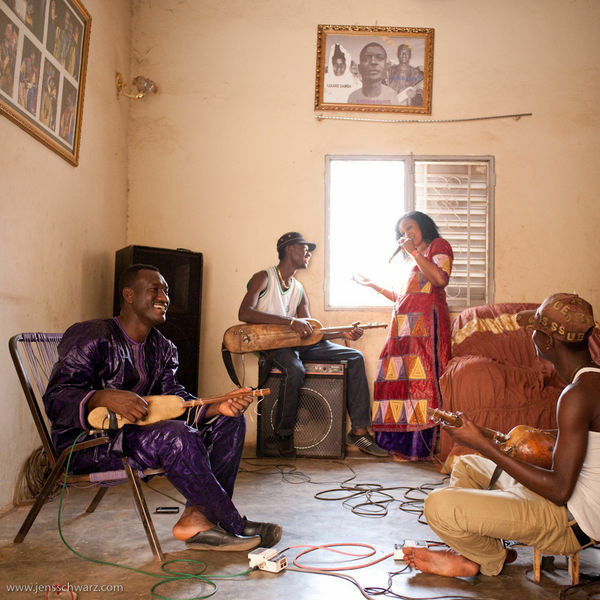 "Defiant, angry new music from Mali, by the world's greatest exponent of the ngoni, the ancient West African lute ... Magnificent. " "Jama ko" means 'a big gathering of people'. It is a call for unity, peace and tolerance in a time of crisis: no matter who you are, let us come together and enjoy life, and celebrate the true spirit of Mali. It became political by accident. In the afternoon of the first day in the studio the military overthrew the president Amadou Toumani Toure (ATT). It was a shock for Bassekou as the former president was a great supporter of his music. Somewhere between power cuts, fuel shortages and the uncertainty of daily curfews the recording went on. Meanwhile the situation in the north of Mali was getting worse and worse by the day. In the studio a musical answer started taking shape: Instead of keeping quiet Bassekou plugged in his wah wah pedal, cranked up his amp and let loose: "Ne me fatigue pas": don't wear me out. You can hear the heartbeat of Malian music pulsing in this music. Howard Bilerman (Arcade Fire, Godspeed You! Black Emperor, Coeur de Pirate) recorded the album in Mali and ended up mixing and co-producing most of it back home in Montreal. Andrew Barr and Brad Barr (Barr Brothers) added drums and guitar. Mocky Salole (Feist, Jamie Lidell) came up with some additional arrangements and played organ and drums.